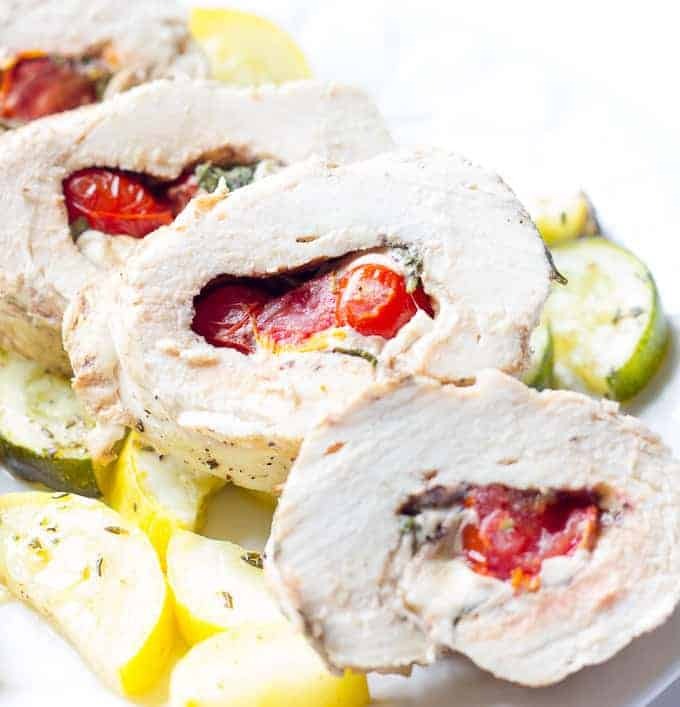 Caprese stuffed chicken foil packs can be cooked in the oven, on the grill, or even over a campfire. They’re chicken breasts stuffed with tomato, basil, mozzarella cheese, and balsamic vinegar; placed on top of seasoned veggies; and wrapped up in foil packets. To make this recipe, start by making a simple caprese salad. Mix fresh mozzarella cheese, tomatoes, basil, and balsamic vinegar. 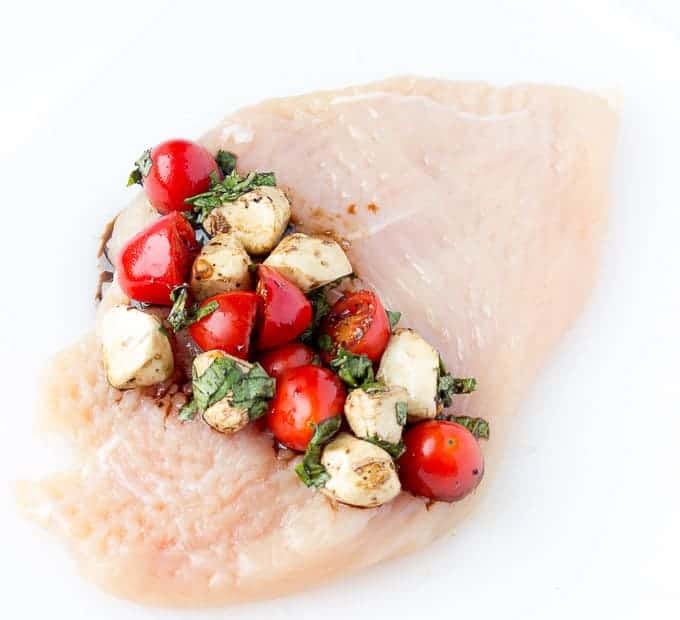 Pile up the caprese salad on one side of a piece of chicken breast that has been pounded flat and thin. Roll the chicken breast around the caprese filling and secure the seam with toothpicks. 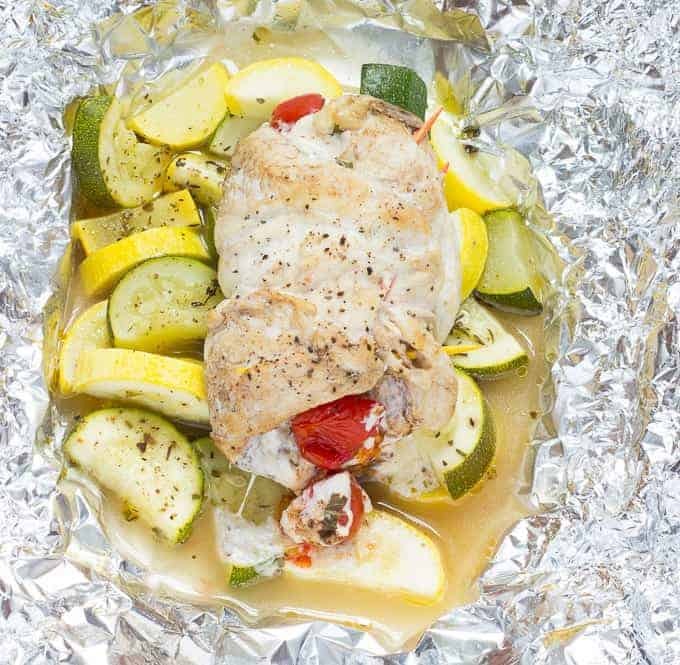 Place the stuffed chicken on top of some seasoned vegetables in the middle of a large piece of aluminum foil. 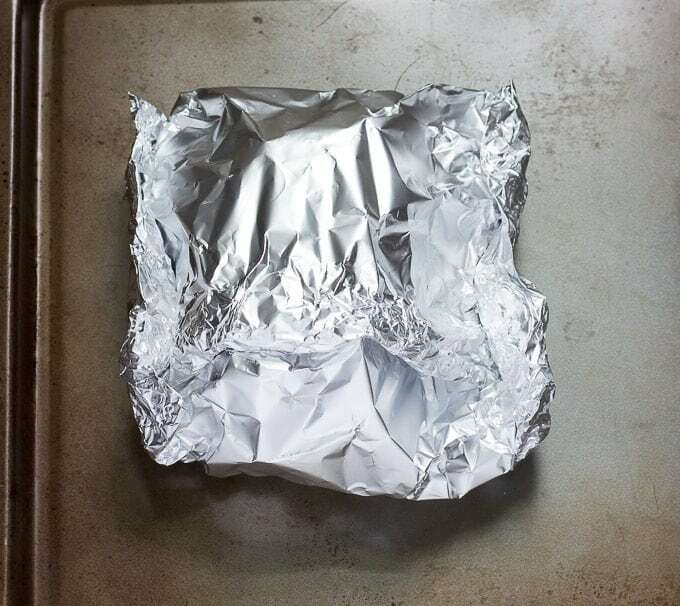 Fold/roll the edges of the foil in towards the center, creating sealed foil packs. Place the packs on a baking sheet. Cook the foil packs until the center of the chicken in 165 degrees F. I baked mine in a 400 degree F oven for 25 minutes. You could also place the foil packs directly on the grates of a grill, or on a grate over a campfire. If you decide to cook these on a grill or campfire, it would be a good idea to double up on the aluminum foil for more stability. I served my stuffed chicken with an extra drizzle of balsamic vinegar on top. To make on the grill: Preheat the grill to medium-high. Prepare the tomato mixture, squash, and chicken the same way except double up on the aluminum foil to provide more stability. Place the foil packets directly on the grill grates. Cook for 20-25 minutes, until the center of the chicken is 165 degrees F. Let them cool for 5 minutes before opening the packets. NOTE: The weight and thickness of the chicken is important. Be sure to use 6 oz. chicken breasts. Fresh chicken is often much bigger than this. Those 3 pound bags of frozen chicken typically have smaller 5-6 oz. pieces of chicken. And, be sure to pound the chicken out so that is only 1/2 inch thick. These two things will help ensure that the chicken gets cooked through (internal temperature of 165 degrees F.) in 25 minutes. 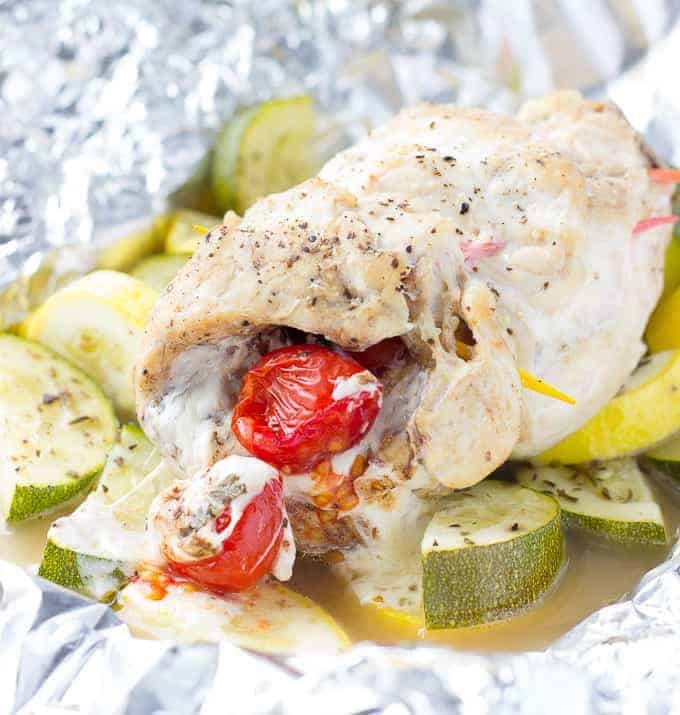 Caprese stuffed chicken foil packs can be cooked in the oven, on the grill, or even over a campfire. 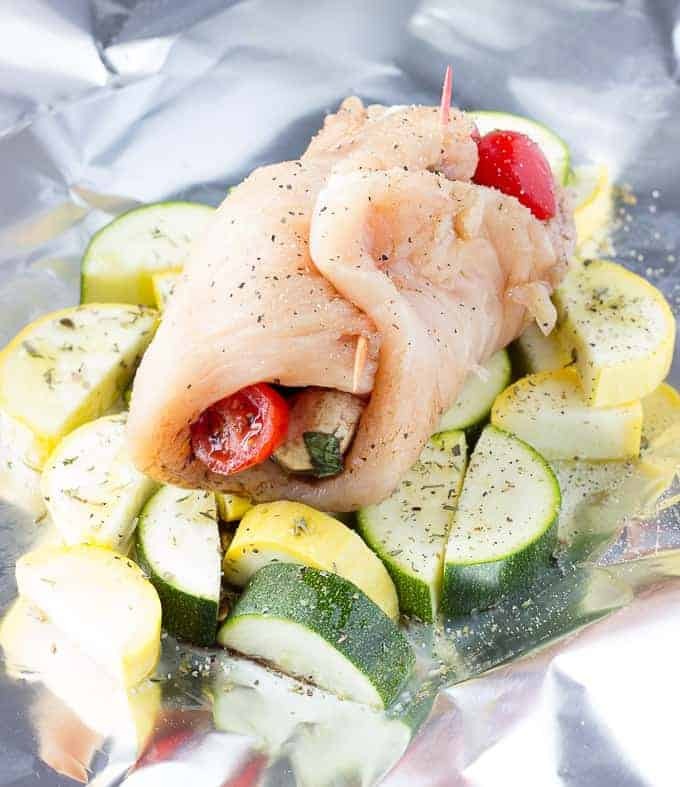 They're chicken breasts stuffed with tomato, basil, mozzarella cheese, and balsamic vinegar; placed on top of seasoned veggies; and wrapped up in foil packets. In a small bowl, add the mozzarella, sliced basil, halved tomatoes, vinegar, 1/4 teaspoon salt, and 1/4 teaspoon pepper. Gently mix to combine. Set aside. Cut the ends off the zucchini. Cut it in half, lengthwise. Then, cut it into 1/2 inch slices (making a half moon shape). Repeat with the yellow squash. Tear off two long pieces of aluminum foil (about 1 1/2 feet each). 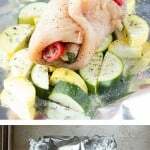 Divide the zucchini and yellow squash between the two pieces of foil, gathering the squash in the middle of each sheet. Drizzle the squash with the olive oil. Sprinkle the squash with the Italian seasoning. Then, sprinkle with a pinch of salt and pepper. Set aside. Place one of the chicken breasts on a cutting board and cover it with a piece of plastic wrap. Use a mallet to pound the chicken thin and flat (about 1/2 inch thickness throughout). Repeat with the other chicken breast. Divide the tomato mixture between the two chicken breasts. Arrange the tomato mixture in a strip 1 inch away from one of the edges of the chicken. Starting with the edge closest to the filling, roll the chicken around the filling. Use 2-3 toothpicks to secure the seam. Try to keep the toothpicks from sticking too far out of the chicken or else they could puncture the foil. Place the stuffed chicken breasts on top of the squash piles. Sprinkle each chicken breast with a pinch of salt and pepper. Bring the longest ends of the foil up over the chicken and roll them together. Then roll the short ends in, making sealed packets. Place the packets on a large baking sheet. Bake for 25 minutes, until the center of the chicken is 165 degrees F. Let them cool for 5 minutes. Drizzle the chicken with extra balsamic vinegar before serving. Prepare the tomato mixture, squash, and chicken the same way except double up on the aluminum foil to provide more stability. Place the foil packets directly on the grill grates. Cook for 20-25 minutes, until the center of the chicken is 165 degrees F. Let them cool for 5 minutes before opening the packets. 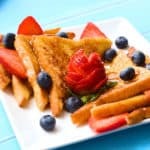 For more great recipes featuring fresh summer produce, check out these other Recipe Redux blog posts. Well now I know what I’m doing with all the frozen chicken breasts in my freezer! YUM! I’ve been thinking of doing a glammed up foil packet dinner. This is just the inspiration I need! YUM! Pinned! 25 minutes at 400. Only if you want salmonella with your meal. Perhaps a comment like that warrants some follow up???? What do you suggest? The chicken being pounded thin makes me think this would be fine. Yes KC. The thin pieces of chicken should take less than 25 minutes to cook through. Please check the temperature to make sure that it reaches 165 degrees Fahrenheit if there is concern. Thanks. Please check the temperature of your chicken if you are concerned about it not getting done. The safe internal temperature for chicken is 165 degrees fahrenheit. I’ve made this recipe twice and have found that 25 minutes is MORE than enough time to cook the thin pieces of chicken to 165 degrees. Anyone tried with a campfire? I have a retreat at the end of the month and I was going to try maybe bringing a prepared chicken foil packet (sounds so good!) to throw on a fire one evening. Do I put it right on teh flame? Off to the side? How long? 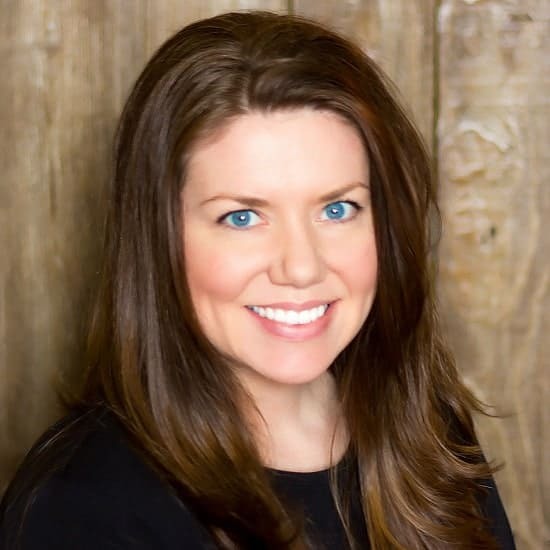 Hi Bonnie-Jean, Please cook your chicken to an internal temperature of 165 degrees F as the recipe states. When the chicken is pounded to 1/2 inch thickness and rolled around the filling, I’ve never had a problem with the chicken not being cooked through after 25 minutes at 400 degrees F. But, things happen. Maybe the chicken doesn’t get pounded thin enough. Maybe the oven temperature is off. That’s why I state to cook the chicken to a temperature of 165 degrees F.
Could I just cook the stuffed rolled chicken in the oven without foil packets? I like my veggies a bit more crisp and would rather do them in the steamer, but this chicken sounds great! Hi Amber, Absolutely! It would still work just fine. I would use a thermometer to make sure the chicken cooks through. I have this in the oven right now:) It smells amazing! We love caprese and squash so I think this will be a big hit. Next time I might add a thin slice of prosciutto on the chicken and then add the filling. My roommate does not like basil. Do you think I would be able to sub spinach for basil in some of the chicken breasts? HI Lindsay, Sure, you could sub spinach and that would be great. Honestly, if it were me, I’d just leave the basil out and not sub anything for it. This looks great AND easy.. two of my favorite things. I’ll be BBQing these foil packs on Sunday thanks!!! Came out great! Chicken needs to be thin (as stated in recipe) and with that being said, the cooking time was perfect! I made it both on the grill and in the oven.. Both ways came out great. Def helps to add a little extra balsamic after it’s done! Will make again! 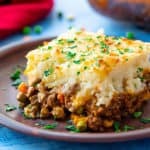 Could I do this recipe without the vegetables under the chicken? I’m not a huge fan of zucchini or squash but if they serve a purpose, I’ll get over it lol. Or is there another vegetable you could suggest to go with this dish? Can’t wait to try this recipe. Hey Arielle! 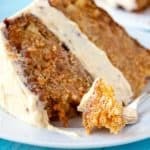 I know it has been a while, but I just found this recipe and am like you, not a huge fan of any squash in general. 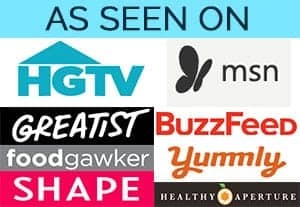 Did you make this dish? and did you sub for other vegetables? I was thinking asparagus or maybe even baby potatoes, but I’m not sure. Let me know if you tried anything else or just didn’t use any veggies. Hoping this chicken turns out well! Sounds delicious. I’m going to absolutely give this a try. I’m actually going to try it with a shortcut. Sams Club has Formaggio Marinated Mozzarella balls that I’m going to use for the stuffing. I’ll toss the tomatoes with a few TBs of the marinade and maybe spoon a bit on the top before closing the foil packets. I’ll let you know how that works. This was so easy and delicious!!!! Amanda, this looks and sounds delicious. I can’t get yellow squash at this time of year. Any ideas for another vegetable that would go? Can I freeze these and cook later? 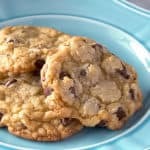 This was a fantastic recipe! 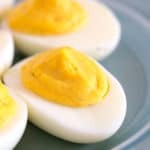 Easy to make and delicious to eat!